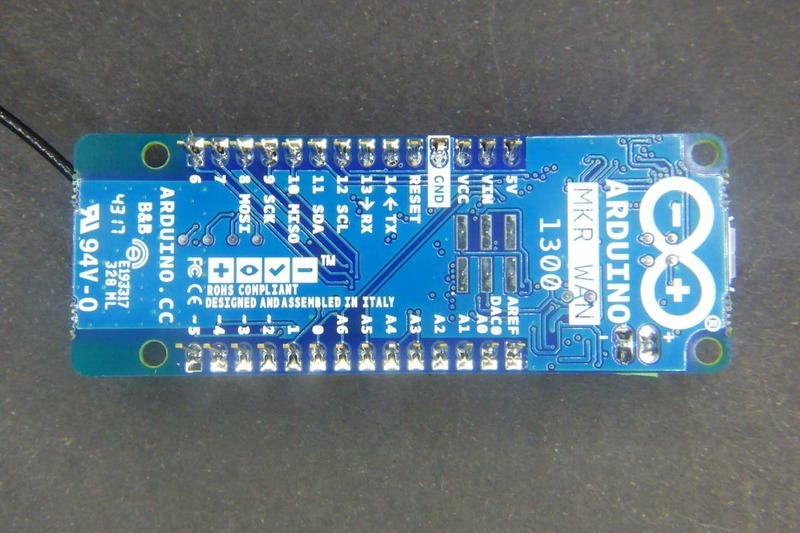 The device is one of the MKR series Arduino is pushing forward. So far the family includes the MKR ZERO (did they name it after the RPi Zero? 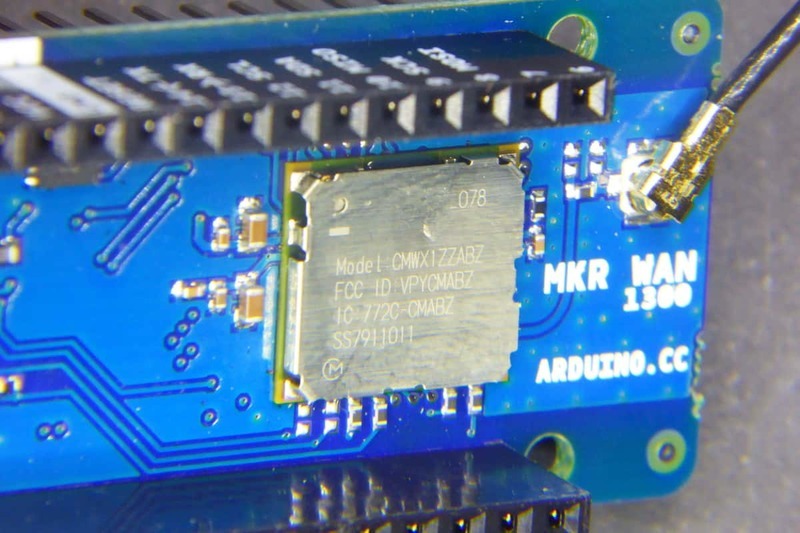 actually, it’s named after the Cortex-M0+ MCU, and it had that name “far before the RPi”, as David Cuartielles has pointed out), the MKR 1000 with WiFi, the MKR FOX 1200 with SigFox support, the MKR WAN 1300 and the MKR GSM 1400. They all sport a SAMD21 Cortex-M0+ [pdf, datasheet] 32bit low power ARM MCU clocked at 48MHz, 256Kb of flash memory (to store your code) and 32Kb of SRAM. That’s quite an improvement from the Uno family (ATMega329 / ATMega32u4). It also has a bunch of digital IO, most of them PWM, several ADC of up to 12bits depth, hardware UART, SPI and I2C and even one DAC (!!). But the reason this is my first MKR dev board is its LoRaWan compatible module. A Murata CMWX1ZZABZ that includes a STM32 microcontroller with an AT firmware you can interface with from within your sketches. There is still little information about the board in the Internet. Sure you can find press notes but there is little hands-on stuff yet: the MKRWAN library repo and a “Getting started” repo by Gonzalo Casas from TTN Zurich. Gonzalo uses the Arduino IDE to explain the first steps with the board. But I’m going to write here about my experience using it from my favourite environment: PlatformIO. UPDATE: Just a small update since I have been doing some research on the board and I found out there is no info about the LDO it uses. The schematic just states a generic “LDO2SOT89-3L”. After trying to decode the label in the LDO package with a magnifier (“N8 7IT”) and googling around I think the LDO is an AP7215 [PDF, datasheet] by Diodes Incorporated. This is a low dropout voltage LDO (aprox 1:1 to Iout, i.e. 300mV at 300mA), with a maximum input voltage of 5.5V and 3.3V output at stable 600mA (max of 750mA), more than enough to power the SAMD21 and the Murata module (128mA max transmitting at full power). The LDO has also a pretty low Iq of 50uA. Yes. The MKR WAN 1300 works just fine (almost, see below) with latest Arduino IDE versions. But I just happen to use not Arduino IDE. So I quickly headed to my favourite builder, PlatformIO, listed the supported boards and… no luck. The 1300 was not there. 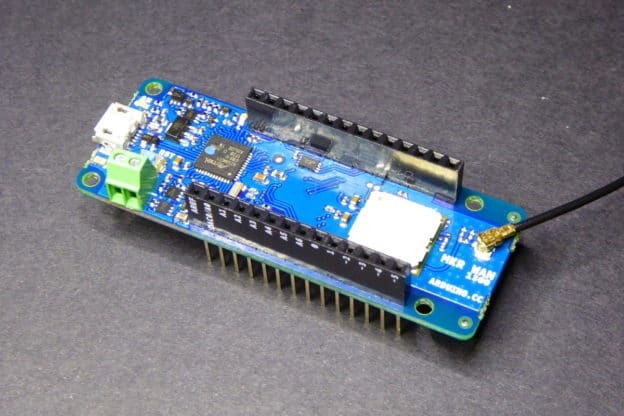 There are quite a few SAMD21 boards supported, starting with Adafruit’s M0 boards, some Arduino MKR and others. But not the MKR WAN 1300. Next I tried using MKR ZERO board assuming that since it is the minimum common denominator for all MKR boards I could get something out of it. Wrong. As it turns out there are some small details as the device signature that prevent it from working with other boards. Albeit more obvious differences like available GPIOs in the headers. Long story short, I migrated the configuration from Arduino IDE to PlatformIO, comparing them with other MKR boards already defined. There are two packages that require an update and I have submitted pull-requests for that to PlatformIO. I don’t know what’s the policy they have about supporting Arduino boards. Somewhere I read something that made me think they have an automatic process, but as of today the packages are obviously outdated. Anyway, the changes are in the AtmelSAM platform (see PR here) and ArduinoSAM framework (PR here). While the PRs are not merged you can install support for any SAMD board and then patch those packages in you .platformio folder. No that I can flash the MKR WAN 1300 using PlatformIO let’s go to the LoRaWan part. The people from Arduino have released a library just for that. 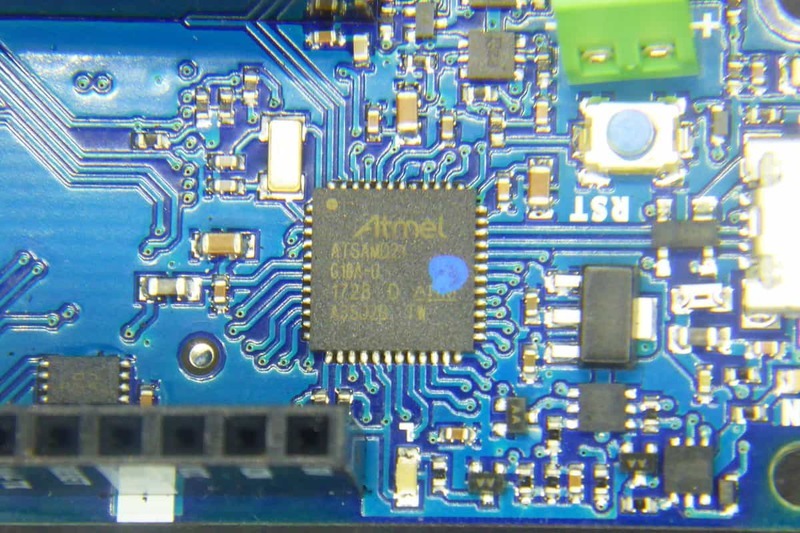 The Murata module in the device has a STM32 frontend that exposes an AT command interface you can use from the SAMD21 using the MKRWAN library. Both the firmware for the STM32 (mkrwan1300-fw) and the MKRWAN library are available on GitHub. But you can also install the library using the PlatformIO library manager. Install and test. There is a full example called FirstConfiguration.ino that does it all. Shows the device EUI so you can register it in your TTN backend and allows you to join via OTAA or ABP and send a test message. Cool. Register to your favourite LoRa network and we are ready to go! Are you connecting via OTAA (1) or ABP (2)? Wow. That was amazing for a first test. I was very pleased to see that OTAA worked out of the box. But ABP did not. After digging a bit on the problem with ABP I hit a dead end when I couldn’t find the documentation for the STM32 firmware. So I decided to open an issue on the library repository on GitHub last Friday and on Monday it was solved. Not bad! As a side note, the STM32 firmware repository was not public yet (that’s why I couldn’t find any docs) but that has changed this Monday 29th January. You will now see the progress of the upgrade and a final “Flashing ok 🙂 ARD-078 1.1.3” message. Good. Now what? Well, looking at the TTN console I noticed the message actually went through… Looks like it timed out before receiving the ACK. There are some things to improve yet but the overall initial experience is very good. They are actively working on fixing problems and that even better. Now it’s time to do some real life tests to see if this is a dev board of choice. 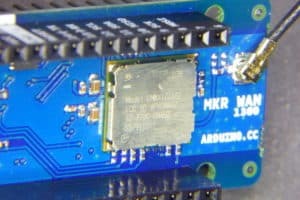 Arduino MKR WAN 1300 by Tinkerman is licensed under a Creative Commons Attribution-ShareAlike 4.0 International License. 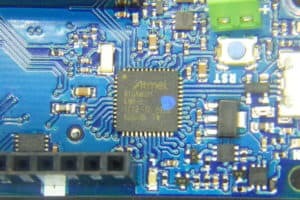 Have you managed to boot up this module using batteries ? 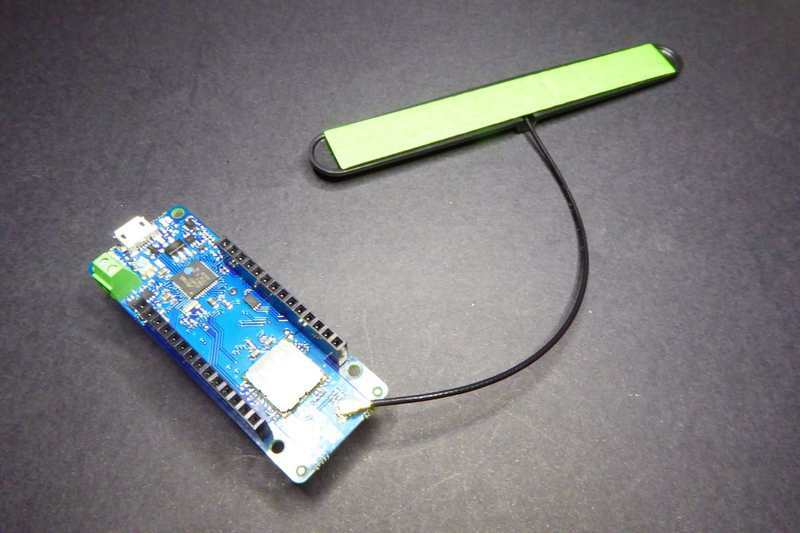 I am pretty sure that the Murata module has AT command support for FSB (Frequency Sub Band), but it does not seem to be an available choice in the Arduino sketches. If I look at the MKRWAN.h library, it would seem to be lacking as well. Not sure how to modify this code to make FSB available or what approach to take to have it modified. It is really required for common 8-channel Gateways (US915) such as those from Multitech and Laird. Excuse me, I’m a little new to this. That antenna that you have connected is very necessary? Do you know where I can buy it? The antenna was in the same package as the MKRWAN1300 I bought from Arduino. And yes, if you are going to use the radio you must always have an antenna connected. Any 868MHz antenna with uFL connector will work. You can also find uFL to SMA cables and plenty of SMA antennas available in the market. 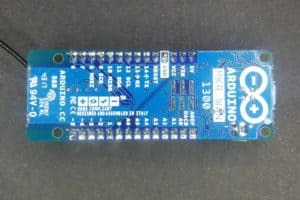 is it possible to attach a ESP8266 to this board? I am trying to make a wifi-sniffer to enable geolocation with Collos. There are a number of ways to connect any two microcontrollers. Actually the ESP8266-AVR bridge is quite common and it’s normally done using UART. You can do the same with the SAMD21 in the MKRWAN1300.